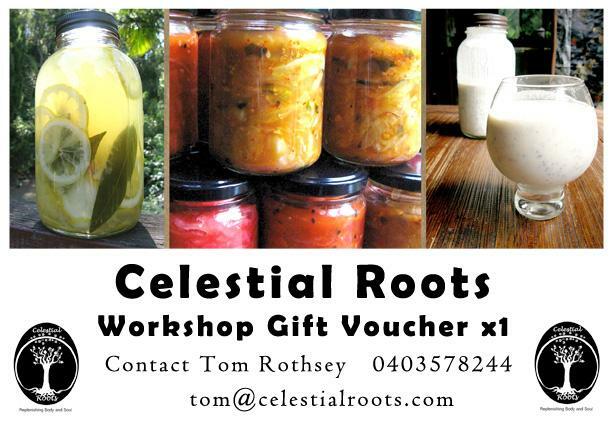 Celestial Roots workshop and services gift vouchers are now available for one or two people. Give the gift of optimal personal health and dietary empowerment with a Celestial Roots workshop gift voucher. Workshop vouchers are for one or two places at my workshops in and around the Coffs Coast region of northern NSW, Australia, and consultation and reflexology vouchers come in a variety of one person formats. The workshop is 4.5 hours, and we make sauerkraut, traditional Korean kimchi, beet kvass, Japanese gobo-style radish, Slovenian sauerruben, dilly beans, carrot with green mango and ginger, Indian spiced cauliflower, and whatever is possible given seasonal availability. Included is a 108 page ebook packed with recipes, and information you will find nowhere else. Also included is my ebook on calming and repopulating the gut, which details my own tested protocol for gut repopulation. Post workshop advice and troubleshooting is also provided as part of this value-packed workshop. Participants provide their own equipment and ingredients, and a preparatory document is sent out clearly explaining all that is needed. The ebooks are also sent out at this time. We will look at current dietary and lifestyle choices to discover areas that would benefit from the introduction or avoidance of individual foods, emotional patterns, thought forms, or habits. We will consider the quality of the foods we all eat, the residual nature and effects of the chemicals and practices used in modern agriculture, and the all-pervading influence of environmental toxins on our health and well-being. Together, we will work to devise strategies to make positive changes where we can, and to minimise risk and exposure where we can’t. Where appropriate, over the course of several consultations,we may address counterproductive energetic or emotional blockages in depth, and we may decide together that reflexology or body energy/chakra balancing work would be beneficial. Reflexology is not foot massage. Rather, it is a therapy with over two thousand years of history that was refined by registered nurse and physiotherapist Eunice Ingham in the early 20th century. Reflex points in the feet that together correspond to all parts of the body are stimulated to work the physical, emotional and energetic bodies. It is a powerful therapy with proven results. I have been a reflexologist for 20+ years, trained in the Ingham method, the most comprehensive and refined school of reflexology. In my treatments I incorporate the principles of reflexology, zone therapy, foot analysis, acupressure, chakra balancing, zero balancing and energy linkage as appropriate. Vouchers are available for one off general treatments, or for courses of treatments either general or targeted toward helping the body resolve a specific condition. General 1 hour $70, General 1 hour x 3 $195, First Treatment 2 hours $120, Subsequent Treatment 1 hour $70, 1 Month Treatment Plan $315 (1 x 2 hour initial consult and treatment, 3 x 1 hour treatments), 3 month Treatment Plan $575 (1 x 2 hour initial consult and treatment, 3 x 1 hour weekly treatments, 4 x 1 hourfortnightly treatments).